The task chair has been designed specifically for people who perform repetitive movements during the course of their work day, such as computer programmers or others who spend a lot of time at the computer. It is manufactured with comfort in mind, and is ergonomically designed with adjustable parts, such as adjustable seat height, adjustable arm extensions and an adjustable back rest. Leather task chairs provide optimum comfort and are often called the "Rolls Royce" of the task chair, as they are highly adjustable and very comfortable to sit on. Despite what some people say, a leather chair feels great to sit on. Leather is soft and flexible, and it breathes, making it perfect to use in both the chill of winter and the middle of summer. The ability it has to adjust to any climate or temperate, make it perfect to use in centrally heated or air conditioned office settings, and in the home office as well. One of the advantages of using leather task chairs is that leather is extremely hard wearing, making it an ideal choice for a chair that gets a lot of extended use. It is also very simple to clean, with most marks rubbing off easily. 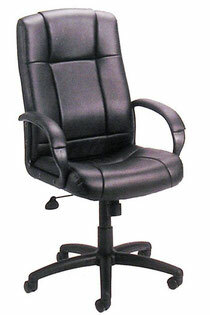 With proper care, leather task chairs can be used for years, yet still look very good and sharp. They give a real classy look to any office, and should not only be used for the executive but for all workers. While they do cost more than chairs covered with other material, such as mesh material or fabric, they are definitely worth the money you pay for them, especially because they are very long-lasting. A simple office or task chair made from primarily leather will cost anywhere from $350 to $500, while the executive version will often be over $1000. Most of these types of chairs are either black or brown, and they match well with almost any office workspace. They are available from most office supply stores, or those stores that sell office furniture, including Office Depot stores. You are also able to purchase them online. The ability to purchase them online gives you the opportunity to compare prices and features from many different stores, before making your final decision. As leather task chairs cost considerably more than the regular office chair, it is important to choose your chair carefully, so that you get the best chair for your investment.